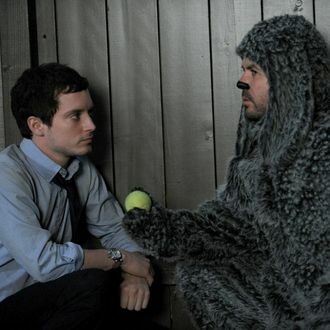 FX has officially picked Wilfred up for a third thirteen-episode season. Also, FX announced that David Zuckerman, the man who adapted Wilfred for FX from the Australian original, has stepped down as the showrunner, turning the ship over to writer-producers Reed Agnew and Eli Jorné. Premiering next June, this will be Wilfred’s first season without its Thursday night buddy, Louie, which was previously announced to be skipping 2013. Either way, it appears your “guy in a dog costume” costume (or, if you’re a weirdo, your Elijah Wood costume) will be good for next year’s Halloween as well.